Successfully Added Digital Voice and Telephone Recorder (Private Investigator Edition) to your Shopping Cart. 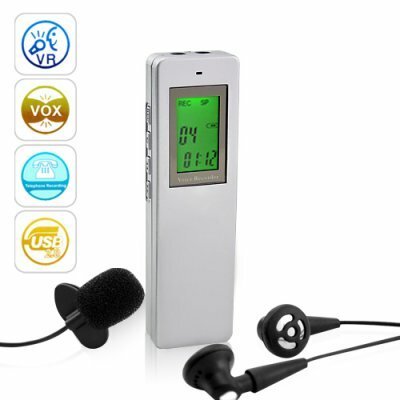 This digital voice and telephone recorder comes with an audio detection recording function, 2 GB built-in storage, FM Radio and also works as a regular USB drive to store personal files as well as MP3 music files. If you love gadgets then you're going to love this amazing digital audio recorder. Fashionable, stylish and compact, this 2GB digital voice and telephone recorder with FM radio offers one touch recording when you want it and different quality recording modes when you need it. Its telephone recording function also allows it to be used a secret voice recorder, after all, people on the end of the line won’t know they are being recorded. Furthermore, you can leave this recorder hidden in a book shelf or on your desk, and when people start to talk while you’re not around, then this gadget will automatically start recording. To conserve storage space, the automatic recording feature, will pause and record automatically by itself, so when sound is no longer detected, it will pause and lay there in wait for its next prey. This multipurpose digital audio recorder can be used in lecture theaters and class rooms for later revisions, and also be used to record telephone conversation. This telephone recorder is powered through its built-in rechargeable battery and supports MP3 and WAV audio files. Before heading out, load this audio recorder with your favorite music and have it ready to keep you entertained while commuting to and from work. Click "Add to Cart" right away to buy one for your home, office, or car and then stock your online store with this incredible all in one voice and telephone recorder gadget - from the online leader in direct from China wholesale electronics - Chinavasion. Is a great mp3 player too! How can I change the recording format? The recording format depends on the recording mode: If LP is selected as the recording mode, then the recording format will be ACT, if SP or HP is selected then WAV will be the recording mode. MP3 is supported for play back not as a recording format. How can I activate the voice detection recording function, (VOS)? - 1- At the back of the audio recorder is the power on/off button, make sure it on the “ON” position, then long press the play button located at the right side of the audio recorder to power the unit on. - 3: You will then be able to select the VOS mode (an ICON in a shape of a persons head will appear with VOS written beneath it). To select the VOS mode, press the "M" button again. - 4: To use the VOS function, after selecting it, press the record button on the left side of the audio recorder. Now, when the voice recorder detects sound, it will automatically start recording, when no sound is detected the recording stops. - The reason the REC button has to be pressed, is to put the voice recorder on standby, so the second sound is detected, it starts recording. To get out of the mode function, just press the “M” button again. To select different modes, after pressing the “M” button, you can navigate between each mode selection by pressing the left or right arrow buttons located on the left side of the voice recording.